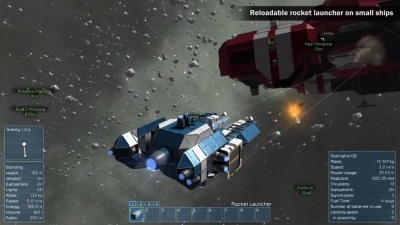 The Reloadable Rocket Launcher functions similar to the Rocket Launcher, it uses 200mm Missile Container for ammo, but has more sustained damage potential because it can automatically reload its rockets. It has large conveyor ports on both sides to allow the missiles to travel from the Cargo Containers. The dimensions of the Reloadable Rocket Launcher are 1x3x3. It has 2 big conveyor ports on the sides, so you can connect it to storage containers. It fires in the same manner as the Rocket Launcher, however it will draw it's 200mm Missile Container from a connected cargo container. The only compatible containers are Medium Cargo Containers, and Large Cargo Containers. Shoot Once - When activated, fires a single round. Shoot On/Off - When triggered on, it will attempt to fire indefinitely until turned off. Both Rocket Launchers, and the reloadable here do the same amount of damage, just to clarify. The regular launcher just cannot be automatically reloaded since missiles cannot travel through small conveyors. Don't fire a Gatling Gun, and fire rockets at the same time if they're next to each other. 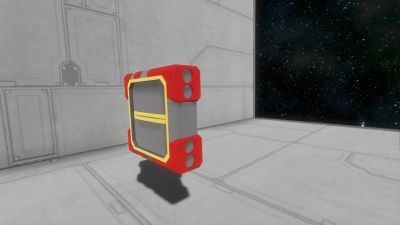 This issue applies to both Rocket Launcher, and the Reloadable Rocket Launcher blocks: If going at high speeds while manuring, it is possible you can hit yourself with your own missile as it leaves the launcher. be cautious in combat. This page was last modified on 21 October 2018, at 15:55.